Today I’m going through all my notes and memories and business cards and free stuff from this past weekend’s SXSW interactive. This was my third time attending. It felt much bigger than last year, and that both helped and hindered my travels through it. On the upside, there were lots of fresh faces and more choices for panels. On the downside, parties were crowded and hallways were full, which meant some of us waited in line for a full hour to get in to one party only to get frustrated and leave after all that time. It would be tough for SXSW to scale much bigger and still maintain the great sense of intimacy and equal access I’ve enjoyed there for the most part. That’s it. Nothing on the back. Just my standard online username and URL, which easily leads you to my web site, blog, phone number, email address, and flickr account if you plug it in to any old popular search engine. 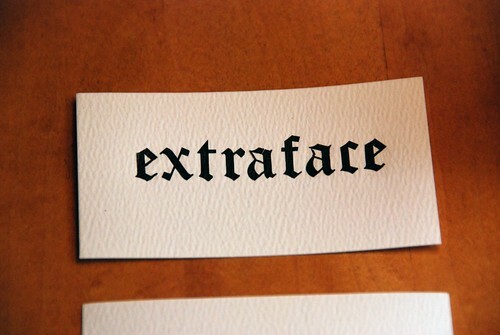 If I make business cards with fuller information, I end up with the word “extraface” over and over again on the same card. Still, there was no way I could make large quantities of these, as you traditiionally would for a big event. I also only had five X’es in the set with that typeface, so at most I’d be able to make five Extraface cards. I made a couple more before the trip, grabbed the rub-on letters and the cardstock and packed it all in my bag. One of the first friends I ran in to at the conference was Chris Schultz from Voodoo Ventures and Flatsourcing. He mentioned that my cards tied in to the subject of Brian Oberkirch’s talk at FOWA Miami, about how the currency of identity is changing from e-mail to URL to username. As we sat down and waited for a panel, I splayed out all of my cardmaking materials on the floor and made a few more cards. I tweeted that anyone who needed an extra business card or two was welcome to come join me, and my friend Jonathan from lk9 made a spare card for his business. 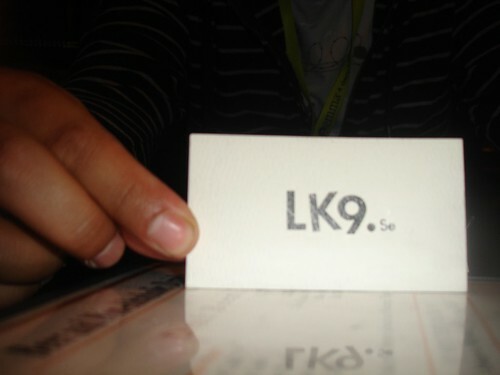 Throughout the show, I had a total of maybe 9 business cards to hand out. Each time the card exchange part of the conversation came up, I would explain that I only had a few cards and had made them all by hand, and then I would pull out my favorite. I gave people the choice of either taking one if they really liked it, or taking a cameraphone picture of it since that would get them all of the necessary information. People really seemed to like that idea. Among the recipients: I gave one to Daniel Burka from Pownce. One went to artist Dan Shefelman, who I met at the Frrvrr party. Matthew Levine from Technorati got one, after I spotted his beautiful notes at the Jared Spool talk. As did Andy Carvin from NPR. Brian Kalma, Director of Creative Services at Zappos, who I had met last, year took a cameraphone pic of one. I also gave one to the guys at howyadoing.org, a neat new “global mood ring” site. I’d love to know where they all went and who all saw them, so if I’m leaving anyone out please let me know and I’ll add you here. I felt good about giving out and showing off something that I made with my own hands, imperfections and all. It also probably helped to scratch the crafting itch for me at a time when I’m mostly focused on technology and things that happen outside of the space of physical objects. I’m running out of Chartpak letters but I can see doing this same thing again next time I need cards. Those are really cool. Yet another reason I wish I had made it to SXSW: To get one of those, or at least a picture of it. Thanks Chris! I’ll send you one if you like. I’ve got plenty of Futura letters left if you’d like me to make you one that says something else too. Hi! Found you through some other Atlanta follows on Twitter. That’s a great idea for a card, keeping it simple. I made some Moo cards with just my blog’s URL, but haven’t had the opportunity to give them out yet (not much reason to, for the moment). Wish I could’ve visited SXSW…I didn’t hear about it until I started Twittering this year, but maybe next year!